This is my final post for my guest editor role for The Girl Who Knows, the place to build a business and life with soul. The Girl Who Knows is a great site for digging deeper into soulful living all while keeping things grounded. It’s been a joy to share recipes and other wellness articles there for the past few months. Hope you enjoyed our collaboration! Constantly going going going? Or in a period of your life where it’s non-stop? The last thing on your mind when you’re super busy is what you’re going to make for dinner when you get home, am I right? Well, I’m going to share two simple practices that can actually be the saving grace of your week. 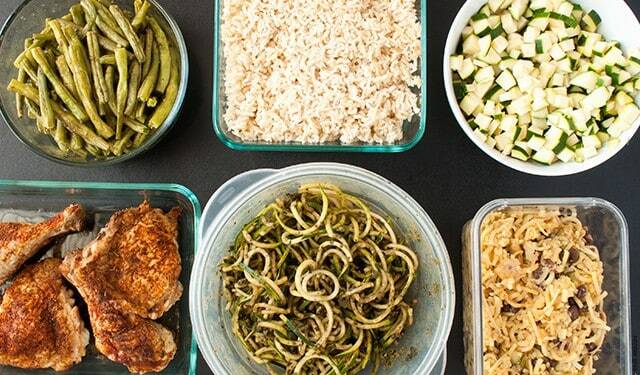 Meet Meal Planning + Batch Cooking. These two things can radically help you free up time during the week – giving you time to squeeze in a short break or catnap to recover from life’s madness. Meal planning and batch cooking take most of the thought process out of dinner and can keep you eating healthy and safe from the clutches of a drive-thru or food that will make you feel blah later. Batch cooking is the biggest part of this time-saving-duo during the week. Essentially how it works is on a weekend or quiet day before the busy week begins, you cook as many meals as you can for the week. You can also cook all of the ingredients and then assemble the day of the meal itself. For a lot of people, batch cooking can feel a bit overwhelming. Like they’ll have to set aside a whole day (or more) to be in the kitchen. Luckily, it doesn’t have to look like that. You can start small with one or two meals and ease your way into batch cooking. And trust me, once you start, you’ll wonder why you haven’t done this sooner! Read more on how to ease into batch cooking at The Girl Who Knows.